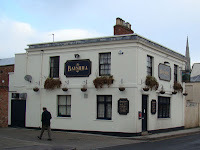 When I lived in Cheltenham (1978-79), I visited many pubs (although there is nothing special about Cheltenham in this regard). Head and shoulders above them all was The Bayshill, and when I visited last week I was delighted to find that it remains a top-grade drinking hole in the middle of town. 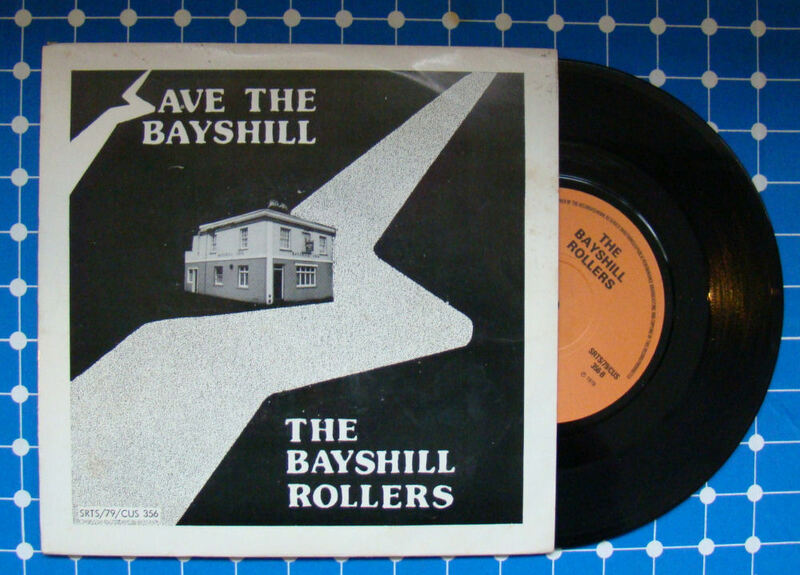 During my brief tenure as regular there was a demolition scare: it being the sort of place that attracts those sort of people, some musically inclined locals immediately founded The Bayshill Rollers (yes, it's a pun) to release Save The Bayshill, which I bought. The B-side is the rarely heard Cheltenham Ladies - the College Ladies were a frequent topic of conversation in the pub. Presumably they still are. 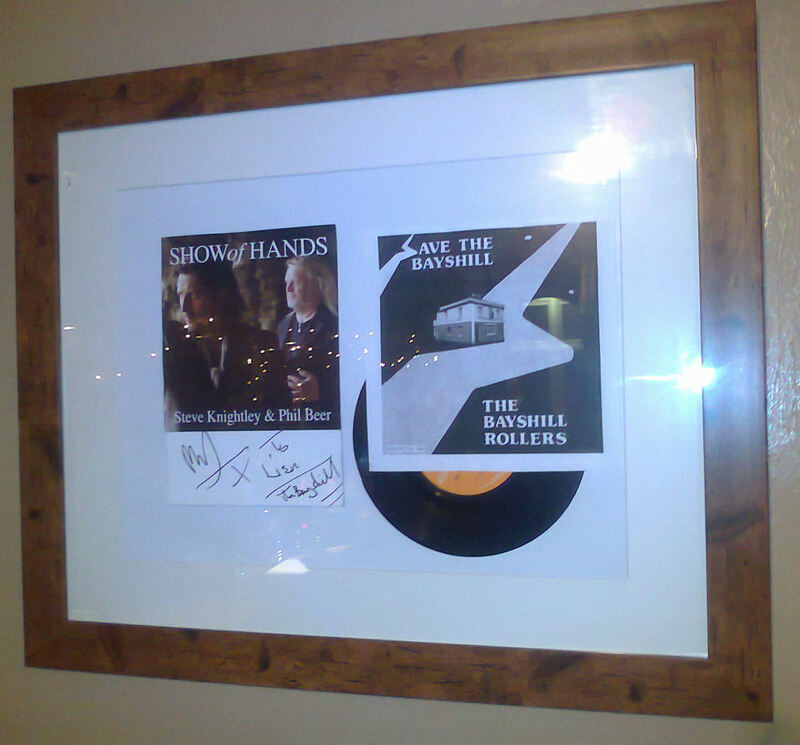 It was splendid to see a copy of the disc mounted on the pub wall. 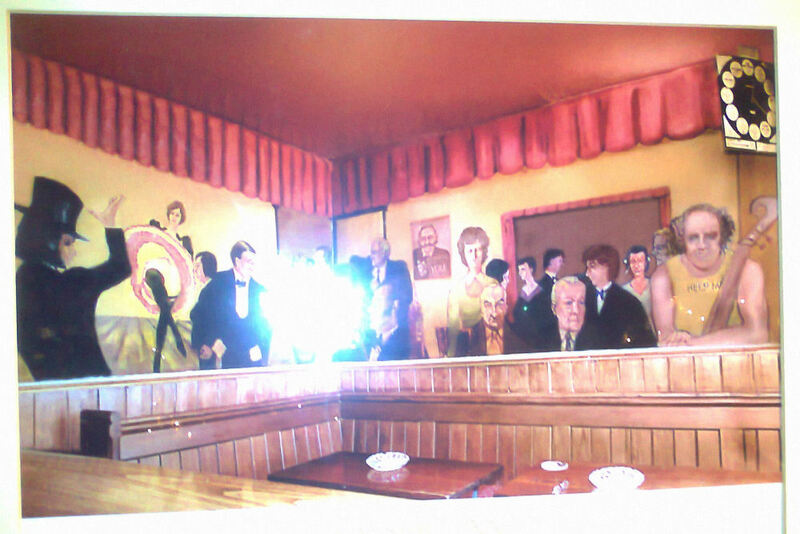 Alongside it was a picture of the public bar mural which had featured a number of well known locals (not me - insufficient length of service). It photographs badly but fourth from the right (bow tie) is Aubrey Lewis, with whom I used to work at GCHQ. He was 60-ish in those days, drank beer prodigiously, and smoked lots of Capstan Full Strength cigarettes: a model for us all. Some years ago, the Frau was 28 years old: one day she became 29 and I cockily wrote in her birthday greeting "No longer perfect, but irreducible", and since that date have paid close attention to the primality or otherwise of our respective ages. She was pleased and impressed when I noted that both before and after our recent birthdays (many thanks for your cards and gifts), both our ages were semiprime: which is to say all four numbers have precisely 2 prime factors (but you knew that already). What is the density of semiprimes? What is the density of consecutive semiprimes: in particular is it asymptotically >0? It took some web-searching to determine that an answer to the first question is x log log x / log x - a result I was unable to prove myself that is predictably due to Landau, although this is reported as a poor approximation, and better, less quotable, asymptotic formulae exist. There does not seem to be a clear answer to the second question, which it need not surprise us pre-occupied the ubiquitous Paul Erdös (did I mention I once beat him at chess?). A simple computer program suggests there are many consecutives, and indeed triples (clearly, 4 in a row is no-go). Heath-Brown has shown there is an infinite number of such pairs  but I am unsure of their density. Anyway, if I live to be 141-142, the pair of us can enjoy this happy numerological event again. D. R. Heath-Brown, The divisor function at consecutive integers, Mathematika 31, 141–149, 1984.